A tour bus containing thirty-something EUTriers and a respectable number of sombreros and more Mexican-themed paraphernalia departed from an otherwise abandoned George Square on the morning of Saturday, 20 October 2012. For a fair number of those aboard the bus, myself included, the Aberdeen Aquathlon taking place that afternoon was to be their first endeavour in a multi-sport event, as well as their first race representing EUTri. The more experienced club members' encouragements and willingness to answer the strangest of questions in the weeks prior to the race had left us feeling up to the challenge and ready to conquer the 22 lengths of that 18-metre pool and the following 5k run, consisting of three laps of the university. After a surprisingly short bus ride we arrived at the University of Aberdeen, where we filed into a room for the race briefing and to get our arms and legs written on. Our coach Linda was already there and asked us how we were feeling. What had on the bus been perfectly ignorable and pleasantly subdued butterflies in my stomach had by now changed into something feeling slightly more substantial and less ignorable - nevertheless, these were still 'healthy nerves' and I found myself feeling quite relaxed as we made our way to the changing rooms. I had only just laid down my towel in the transition area when a voice called out "Ladies in heat one, please gather by the pool, we're starting now!" This was apparently the cue for the not-quite-butterflies to start some sort of frenzy and I abandoned all common sense, dropping my unused bottle of talcum powder and madly running/stumbling to the pool (which was about 10 feet away from transition.. I suppose I could have just walked). There were two people in each swimming lane, and one look into the eyes of my lane-amiga told me I was not the only one feeling as though she must have signed up for this race while temporarily out of touch with whichever part of the brain keeps you from doing very stupid things. Once the race had begun, however, I managed to calm down slightly and kept reminding myself that my only ambition, for the swim part at least, was to complete it. It was great to hear the other girls cheering us on from the poolside - although I do remember thinking it was a good thing that I was in the first heat because I needed all my breath for the swim. Despite my best efforts, I realised I had lost count after either seven or nine lengths, but kept going until, at long last, the marshall tapped me on the head. After two more lengths I happily heaved myself out of the pool and started running towards what my severely disoriented mind told me was the transition area, but which was really the way back to the changing rooms. Luckily, I was sufficiently coherent to realise that the shouting and pointing from everyone around me meant I was going the wrong way, so I turned around and quickly made for my running things. After a very confused transition, during which I struggled to remember that one generally puts on running tights before shoes, the run allowed for a very welcome regain of balance, basic sense of time, etc. The weather could not have been better; it was dry and I was neither cold nor too hot. Towards the end of the first lap my lungs were getting quite sore and obviously wanted me to stop running, but after a few minutes the sensation gradually ebbed away. The running course had seemed a bit complicated during briefing but there were plenty of enthusiastic marshalls and arrows everywhere. After finishing and having a shower, I joined those EUTriers who were rooting for the girls from the other heats and then we watched the guys run. The highlight was probably Michael suddenly bellowing "Give me the hat!" as he ran past our group after his second lap, grabbing a sombrero that somebody was holding out to him, putting it on his head, dropping it, running back to get it, putting it back on his head and spent his final lap, I imagine, holding on to his sombrero. Kudos to you, sir. When everyone had finished and changed, we all feasted on some very nice food while awaiting the race results. After those were announced and several prizes awarded, we headed to the hostel, where we dropped off our bags and attempted to make our beds, which turned out to be quite a challenge for some of us. There was time for a short rest before many a EUTrier changed into Mexican attire of some sort and we had dinner in Aberdeen, followed by a night out in the city. Moustaches of various kinds were proudly sported, a certain statue in Aberdeen was beautified, fun was had by all! 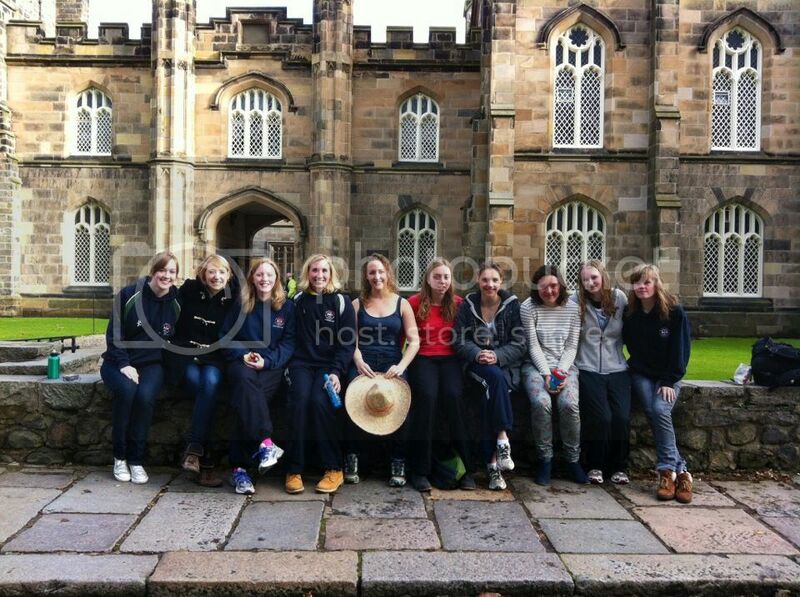 The bus drove us back to Edinburgh the next morning, where we all said goodbye and split ways, feeling tired but happy.